Honestly was the easiest/fastest tickets I’ve purchased on my phone, ever! Dub car show in Dallas! Fix the bugs. Couldn't by a ticket to.a listed event - had to use the website.. And then it didn't show my purchase afterwards.. I had to force quit the app and reopen it to see the ticket. I went to the Festival of life on day 1 at Lincoln park in Newark and couldn’t find a parking spot and if I did luck up I would never have gotten in. There were so many people in such a small park so I went home. I tried again on day 2. I found a parking spot and got in with no problem. Not as many people. The problem was them shooting T-shirts from that canon into the crowd of people. One was coming my way and I was barreled into by a group of people and knocked into the elderly lady behind me. My entire right side was hurt for 2 days. I hope the other lady was ok. Needless to say I never went back again. Freebies are just not worth it even though I left empty handed. Tried to find my tickets no easy way to find them! Had to go back to my computer and print them out! Making this app useless to me. I just updated the app because it was crashing and I still can’t open it. I have tickets I need to get to and it won’t open. This app is extremely convenient! Fast and easy access! It would be awesome if you could choose several cities or a few cities near by. Also to be a able to get an event feed with the cities you select and the events types. I hate that I have to go city by city and type of event to find something. The party was shut down by the fire marshal! I did not get to complete my painting or eat! I want a FULL refund as soon as possible!! Will delete as soon as i can. I really enjoy using this app but there is a serious glitch with the application right now. You can access Eventbrite via the website online but if your trying to use the app it continues to close out. I’ve been waiting a little over a month to see if any update would happen to fix the issue but it hasn’t. Again I love the Eventbrite and use it quite often but I just wish I didn’t have to go online in order to access all the features and I could just use that app that I downloaded for its purpose. Love how easy it is to use this service and I don’t have to print out the tickets! App keeps crashing after update can’t even look up events . I like the overall feel and quality of the app but it fails to provide basic functions. As of this current version, I am unable to cancel my tickets because this is only possible on a desktop computer/laptop. News flash: not everyone carries around their laptop when they’re on the go! If I’m in a car, train, or bus and something comes up, it’s impossible to cancel a ticket from the Eventbrite phone app. I hope this makes sense. Have season tickets. And still unable to get my tickets. No where in the app can I find a way to delete my old tickets! It’s getting frustrating that’s why the one star. Developers I hope you’re reading this you need to make it easier to delete your tickets! Also would be nice to be able to delete recommendations which I really hate. Any of the recommendations that they make for me is nothing I am interested in ever in my life. And I can’t delete it out of my recommendations. Really need to up this update this app and give the user more control! Some events on the service are very time sensitive, needing to enter your information very quickly before it sells out. It’d be nice to be able to pre-load your credit card information from the app. It does save your information from your last purchase which is nice, but if that has to change for any reason you’re out of luck. It had me to rest my password 3 times before i could get in. You have to create an account on safari then login on the app. Muy práctico para estar al día de todos los eventos. I should be able to choose which seat I sit in, rather than have your software choose for me. If that option is available and I missed it, it should be more obvious. I’ve used the Eventbrite app a few times now. Most of the time, I end up on the app because I’ve followed a link directly from an advertised event, which goes to the Eventbrite webpage, and then I choose the ‘open in app’ option. My only issue is that when I go to manually search for an event it the app, there have been a few times when the event doesn’t show in the results even though I *know* the event is taking place. So basically, when I can find an event I’m looking for, I’m happy with the app. But it makes me wonder what things I’m missing out on due to the apps selective search results. I had a promo code i went to use it the next day and it expired! You just went public and now the app crashes on launch 🤷🏻‍♂️ update please. Will not allow sign up to events outside where app thinks i am located, new york. Impossible to get app to find grand cayman. Horrible. Seemed like a nice app. Even has my e-ticket for first event later this week. Then I got an iPhone Xs with iOS 12 and app crashes. Glad I saved the email with my ticket info. I’m never board now! I love Eventbrite! Ios12 iPhone XS Max Black screen for 5 seconds then closes. I’m sick and tired of having to download an app for everything in order to get access to what I need. It seems like the only way to get my tickets without printing them is to download this app. I feel forced to do this and I don’t like that. Then when I get the app, I have to go through a bunch of crap to get to the part where I want to see my ticket. For this reason I’m giving it a 1 star. Such a convenient way to find events and purchase tickets! App won't open. iOS 12 iPhone XS Max. App stopped working after IPhone Xs Max upgrade. Screen just goes black after loading Eventbrite logo, and then closes automatically. Easy to use and reliable!! The app was working great when I first download about a month ago now it won't open. I enjoy using this app to find free events in my area. I hadn’t experienced any glitches or issues until the recent hot fix. Overall, if you’re trying to find paid or free events this is the app to use. Is this for iPhone only? Does it not support the IPad? Don’t know what happened but I am not able to select a seat in the new app! Very disappointing. The Eventbrite app is easy to use and is a great alternative to wasting paper printing tickets. If I’m going to be in an area with dicey cell coverage, I just take screenshots of our tickets. I look forward to continuing to use eventbrite for all of my festival needs and more thx so much !! The app feels like it’s built on web views. Otherwise, the design is quite beautiful. I’m not interested in the pathetic events you’re advertising and get paid for in the process. Get me the tickets people send me. This should be the first interest of the user. I have to scramble to find my reserved tickets, because you coerce me into following a process I don’t wish to be part of. Alright, many companies are doing this, for instance airlines, but it doesn’t mean I like them for it. I cancel my account in protest for not serving me but your interests. I love the ease with which I am able to book events using Eventbrite. This app is useless since it won’t open. This App is wonderful, it allows me to connect with what’s going on around me present and future. This gives me ample time to decide on what I want to do and when. I love it. Please keep the good work up. The new update makes it really hard to find what I’m looking for. Boo! 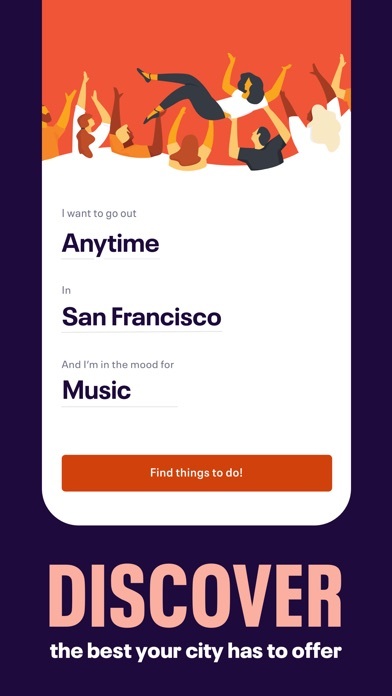 It’s great to reconnect with Eventbrite app. I’ve used it before and is excellent. Thank you for all the events that are at our fingertips. I’m excited to attend a couple of them and purchasing tickets through this app. I am using an Apple iPhone 7 with IOS 11.4.1. After the usual signup process, getting it to find a specific event by searching by town and date is tedious. It did find my event with the the looking glass entry. Once I bought the tickets, the option to view them did not work (did nothing). The option to print did work. Once that was done, the app would not close. I had to double click the home button to get the open apps to show and flick this app into the quit ether. When using my iPhone X the app crashes upon opening regularly. When using my iPhone 7+ I have no problem. I really like the idea of Eventbrite...but how are the “Top Picks” generated? I’m convinced their paid advertising! None of them match anything I’ve saved, registering or searched for. 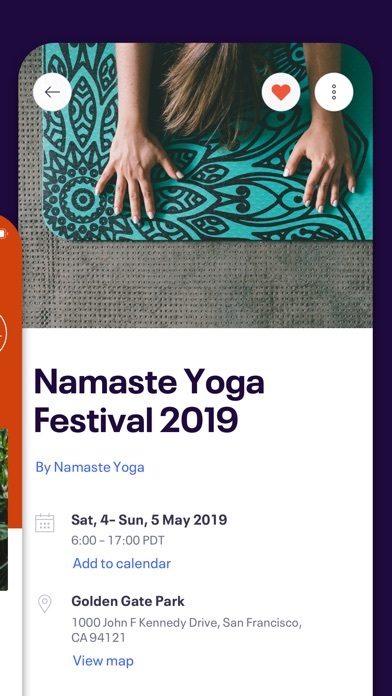 The only time Eventbrite has been helpful is when I’m checking out an event on another page and there’s a link that connects to Eventbrite, yet I’ve found nothing while I’m searching the app. They need to figure this out! When invited to an event. I’m really grateful when it’s through Eventbrite. It’s easy to use and the connection to the phone is fantastic. Lots of great events in all sorts of venues with lots of subjects. Something for everyone! I like Eventbrite because it allows you to pay and get tickets to events online. I also like it when hosting a program because of the flexibility, and record keeping benefits. App is ok but clearly not thoroughly tested. One small example: address fields won’t auto fill because they aren’t properly labeled in code. Also who caries around their credit card for inputting here? Please implement apple pay. This is the only app that I use to search for local events and parties. It’s really easy to rsvp and/or register for events. I always seem to have trouble finding an event. Even when I enter the specific date and/or the title of the event. Not sure if this is an issue for Eventbrite or the event creator. Once I find what I’m looking for, it’s a breeze to order tickets. Just downloaded this app. So far pretty good! Bought tickets for a concert at Thalia Hall. Eventbrite app was seamless, easy to use and access. Used to be a great app to search and find local events happening, now the search feature is all messed up and doesn’t organize results by dates. Very annoying. Wish I could uninstall this update. I had a problem after changing my email in the app. So now web app and mobile app have different content. I cannot see tickets on both mobile and web app. Was so easy and fast great way to get tickets! Install from backup on new device Open deep link from email App opens with black screen and white toolbar and no icons. Reopening app without deeplink shows the same. Not usable in this state. Will try deleting and reinstalling. Awesome! Quick! I wish I could make the font bigger only issue! Overall a decent way to organize and find things to do. Biggest problem for me? The app doesn’t save my “liked” events so there’s no way for me to track them. I would use the app more if this was fixed. Why? Why? Why? Developers think its acceptable to publish an iOS app and never make a slightly different optimized version for the millions of iPads. 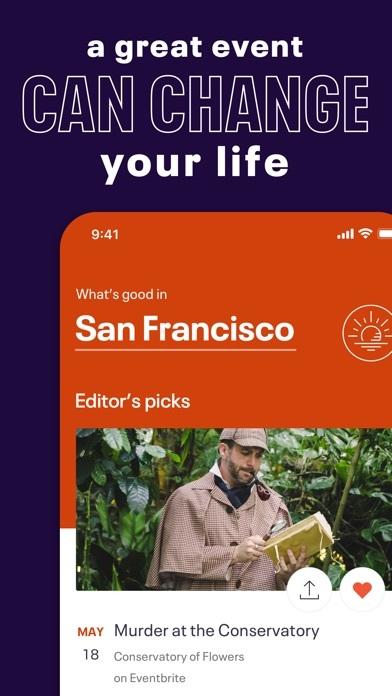 App looks terrible and doesn’t rotate to landscape. Facebook login issues as well. I’ve tried for 30 min to register for a tech event with no luck. I am so upset they promoted 7am to 9pm we got there at 7pm and there was a note saying they closed at 5pm. Whatsss??? Liers on promoting stuff. What a was to thank military kids! Earlier today I bought 3 tickets to the national collegiate rugby championships in Santa Clara, and the money came out of my account. BUT I never got a confirmation email, a view of the tickets, or info on how to get the tickets. In fact, when I logged into Eventbrite, there was no record of my purchase (and yet the $ was taken from my bank account). I do like this app but I am kinda disappointed cause the new update wiped out all my saved credit cards, yes I can easily replace them but I had quite a few saved on the previous version and now it looks like I don’t even have the option to save a card and on top of that now I have to enter a card number every time I want to make a purchase this is kinda inconvenient....I hope the app developers fix this problem. This app needs an option of adding your previously purchased ticket. Most people don’t have only one email address and don’t use their personal email accounts or FB credentials for professional events. I spent 10 minutes trying to add my purchased ticket to the app. It should be simple: add a “search your ticket” option, and let me either scan the qr-code on the pdf or insert my order number. You can do this on all airline apps! I was lost until i found Eventbrite thank you for helping me find my way! Tried to log in to the app, but it doesn’t support the standard password manager on iOS. So I was unable to log in. Looks like a decent app overall, but this is a deal-breaker (I use random strong passwords and depend on the password manager to remember them). Nearly all of the apps that I’ve tried support this functionality. I’ll continue to use the web site for now. Still worthless at “SELECTING EVENTS JUST FOR ME”?!?!??? I have purchased online tickets for GUN & KNIFE show,search GUN & KNIFE SHOW,& the selects ignorant music & crafts shows!!!!!!! E-ticket works great and really nice for finding events in the area! I have the feeling it repeats the events. When I filter it to dates nothing changes it stays how it is. Seems like this app loves not saving my info nor does it bother working with Apple Pay. Best app for finding things to do in my area! I bought a ticket for Patty in the Park. My bank account was charged. I did not receive an order confirmation email. I’ve sent emails but no response. There is no phone number to call for help. I STILL DONT HAVE MY TICKET FOR THE EVENT WHICH IS TONIGHT. I want either my ticket or a refund. Please help. I’m so sorry but you are promoting fake events and fake organizer don’t buy no tickets from this app. I bough few tickets for a techno event in Dallas. And I just found out yesterday that not only change the event dates, but I talk to the manager of the artist and I can show proof of it. The event was for the 30 of March and now they are promoting it for the 13 of April. And the manager of Debora de luka just told me that she is not coming to Texas for like 3 more month, she is very easy to reach. And I don’t even have a answer from the event organizer. This is scam and don’t waists your money like I did. I hope this app resolve me with the money. I’m really thinking to sue this app. I been planing this trip for over 1 month in advance I have hotel reservation and everything and it’s not fair with the costumer be more seriously about your business. I ordered a ticket for the opening night of the tribeca Film festival. I haven’t received any info on it and no one responded to my email. I guess I’m going to have to contact my credit card company and ask for a refund if they don’t send me the information!!! Not sure what exactly changed, but this app freezes all the time now. Its gotten to the point where I can’t even utilize the app anymore. Someone needs to look at what’s going on and make some repairs. Love Eventbrite!! Love discovering events at my local area and as well as out of town. Ap is so easy to use as well. Customer service is also great when you have questions they really do help you. This happened a while ago and I’ve not used the app in a while, but when I tried today, the same issue! I was following a link on a web search results and it did open the app and even flashed the ticket price, but before I get a chance to tap it to purchase tix it overrides the event page with “where do you want to go?” when instead it should take me to the checkout. It doesn’t let me use the link to get directly to the event. So I have to find the same event AGAIN within the app using the search button. This is very annoying. I am deleting my Eventbrite app (which I have used quite often in the past) because EB blacklisted Bridgette Daniel! Bridgette Daniel is risking her life to let us know every day how our democracy and our lives are in danger in the future, which SHOULD BE allowed as free speech!! So, for EB not to let her use her words means they’re afraid of something and they’re blocking her and so therefore I’m blocking and deleting you and your App EVENTBRITE !! Does not show you events from using history of online ticket purchases or your interests. Have to search EVERYTIME. On March 1 I purchased two senior tickets for Mesmerica show on March 29 at 8:30 p.m. in Phoenix, AZ. The receipt disappeared from my iPhone. I called the bank, they gave me the info, authorization number and date of purchase and your contact phone number. I called your phone number and got a msg that said it is no longer in service. I have tried for two hours to make contact. Please send my purchase receipt again or call me. Thank you! I was hoping that I'd be able to edit my earlier review but I can't and the response that I received from the developers was not helpful at all. At the time there was a BUG with your app that did allow you to login UNLESS you were logging in via Facebook. Now, when I try to login, instead of asking for my password it just automatically reset it. Not to mention the unaddressed issue where you can't seem to report app issues to someone who could do something about it. Anyway, I updated the app and it looks like it's working properly now. Eh is all I have to say so far about getting any help from anyone. But as long as there are no issues and as long as you don't need any help ever, then this app is fine. Text on top of text (on mobile)—hard to read. When I followed the link from the venue’s page to Eventbrite I had to run through all this rigamarole about what city, what event etc. Why does it not automatically take me to the event I’m interested in!? They seemed more interested in advertising other events to me. I just want that one event! this still happens! please fix! I went to an event last night and got stuck in line because I couldn’t find the pass! passes are grouped with all other eventbrite events so it makes it almost impossible to find the event you're going to. no other app has this problem. passes need to be ungrouped and chronological! I just want my tickets, I couldn’t care less what’s “going on around me”. We entered credit card number and it went red like we made a mistake. We corrected it-not sure it was wrong; and it still showed red. Did it again. Still red. Changed credit card still red. Went to payout anyway and it worked. Frustrating. I'm in love it! Because it's so easy register as be also know each event an interesting for assist. This app could not find your tickets to save itself. Just wasted an hour trying to find tickets though a email it sent. After paying for the tickets the only way this app finds your tickets is if you pay for them again. Don’t wast your time with this app go with the paper tickets. It an awesome app just only one downside is that you gotta make sure the event has a number to contact just in case. Other than that it’s a sweet and smooth cruise. I have been to several events that I found on event brite! Events for charities,parties, comedy shows and concerts are on the app! Not every location will be there but you are bound to find something near you. I do not know how effective the app would be if you live in a remote area. Easy to use even for an old person! User family in so many ways. Thanks for making your website worth using! I wasn’t frustrated one time. I never, even once, want to throw my phone across the room. I downloaded this app to purchase tickets for my nieces and nephews. Literally just now. When you use the EventBrite app it crashes as uses. Freezes. Then as I add tickets to Applewallet it freezing the event app and freezes your Applewallet as well. I have to open and close the EventBrite to add each ticket at a time. Log in option looks faulty. It automatically sends you a password reset link. How do you log in in this app? Not designed for anyone with more than 1 email address! If you’re sent tickets from a friend or coworker and they send to an email address other than the one you have registered, you will have to create a new account. No way to combine tickets for social and work events. Total management nightmare and big miss in our modern digital world. I just bought some tickets and to get them or my invoice I couldn’t get the App open. It’s still not opening, please help! Another dying app - suicide by social justice Leftism. I wanted to put tickets that I purchased online on my phone. The app wouldn’t recognize my login info that I had just set on my phone where I would have liked to store the ticket. Blah! Wasted time. Why can’t their platform allow for us to write reviews? That would really make ur perfect and I could stop using other platforms for my business and solely use eventbrite! Come on! Why make it more inconvenient to use the app? This app makes it incredibly easy to find and enroll in all the workshops I’ve been looking for! So I have been reading reviews. Your forgot password is not fluid. It should allow me to use my facebook even though I already have an account via eb. Your event managers should have a reviews section! I want you to succeed. Stay away from politics AKA I see AOC on the eb moments! I have about 2k shares in your company, you do the math and I have been in the tech game from Before you started. I do however think you can disrupt the market. Even more so with following those guidelines. CHEERS! This app allows you to get the job done . However, there are some events listed that may not have as much information that you’re looking for, causing you to go out and seek for yourself . But definitely worthy, used in multiple locations across America . No Apple Pay or merging emails. Instead risky transactions and multiple accounts. No thanks. You type in your email address and then the password box comes up. At that point you should be able to use keychain password, but instead it looks like the password re-populates the email address. Needs a fix. The calendar of events for a specific town, say Reston, VA, is not in order of the date but jumps around, months and dates. Very unusual! Eventbrite is a great way to keep up with what’s going on around town and surrounding areas. It is quite easy to use! I bought tickets recently, using the app on my phone. They were for a school performance at a local theatre. I wasn’t asked about seating, so I assumed it was just first come first serve. After buying the first 2 tickets, i had other family decide they wanted to go. I bought a couple more- no problem I thought, except when I printed out the tickets I discovered they were assigned. And because I bought the last 2 at different times- they were all in different places. This was frustrating. When I checked in, they explained it was because I used my phone. For some reason when using your phone you aren’t shown seating choices. Therefore, I’ve deleted the app. I use the app a lot. It is hard to understand why not implemented on iPad. Haven’t been able how to get notifications from only events I want to go to. I’ve had countless great moments with the help of Eventbrite. From dubstep shows to art shows they have it all, experience what life really rewards you with when you take the advantage of some of these awesome opportunities. Took a frustratingly long time (and surging through numerous pages) to finally get to my actual e-ticket. The site should recognize you immediately, and make it very obvious that you already have a ticket to the event rather than sending you to a page that OFFERS you tix. Took seventeen attempts to login as the app wanted to force me to use an iCloud password but my passwords are not stored in iCloud. Super irritating. Getting my laptop out would have been faster. Looking for something free to do with the grandkids for New Years Eve. Looks like I found a cool event on Google, and I used this Eventbrite App to get paperless tickets. It was easy, fast and painless, and my tickets showed up instantaneously once I logged in, no problem! I always screenshot tickets, just in case, but they are there! I am going to use the app now to look for a few things to do with them during the week! The line at the door was ridiculous and VERY unorganized! I NEED MY MONEY BACK. IT WAS VERY UNORGANIZED AND THE BOUNCERS DID NOT LET ANYONE ON THE RIGHT SIDE OF THE ENTRANCE IN. WE WERE ON LINE SINCE 11:45PM. IT BECAME A MOBB AND THEY PICKED AND CHOSED WHO THEY LET IN. I PAID 88 DOLLARS FOR 2 TICKETS THAT I DID NOT USE AND I NEED MY HARD EARNED MONEY BACK!!! So a month ago they had an event. So I decided to buy the ticket for the event. When the day of the event came around, there was no event at all. I felt truly stupid (it was my first event in Eventbrite). I email the merchant and no response, email more than 10 times. I email Eventbrite and they also beat around the bush. So now I lost my money and the trust of this company. Don’t buy from Eventbrite! I just downloaded this app, and all that cones up is an orange screen that says “Eventbrite” with a dark square in the top left corner, and it freezes my screen. I have to close and reopen my iPhone to even get out of the app. There’s no “working” icon in my top toolbar where the time, battery life, signal are, so it’s not like the app is loading anything, just a frozen orange screen. The worst EVER!!! Please refund and never contact me again! Eventbrite is terrible customer service! Charged me twice!! I hate Eventbrite forever and will never go to another event that they work with! Goodbye forever I hope a better company puts Eventbrite out of business today and they suffer in hell and debt for eternity! In this latest update tickets no longer show in my account. They did this previously with an app update and it took them weeks to fix it. Bought tickets and they’re not showing up in the app. Tried messaging for help and a week later I still have no response. (Edit) was told to call the number on my bank statement but that number is no longer in service and the message that it gives me tells me to call the number on my bank statement. I like Eventbrite a lot! Great customer service! Seamless transaction and they’ve answered all of my questions very quickly and with great courtesy. Thank you, Eventbrite! I downloaded the app and have been playing with it for about 10 minutes. Signing up for an account is nowhere to be found there is only a sign in the future, which comes after you make an account. Sketchy ticket service - be warned. Despite buying the ticket more than a month ago, and the show being about a week away, they still can’t even provide the ticket (nor clarity about details). I won’t be buying from them again. This APP is amazing!! Everywhere I go I can log in and find things to do!! Awesome!! Bought tickets and they’re not showing up in the app. Tried messaging for help and a week later I still have no response. But kept annoying me to rate it. Finding events that I had no idea where going on. I like it. Search features and tags need to be improved. It can be difficult to find events based on keywords used and the machine isn’t always smart enough to pull the appropriate research results. Thank you for making this app. It was soooooo easy! Respect! Another person trying to start a business and realizes how hard it is. It’s simple and easy. Why do anything else? Awesome ticket site to use and very easy love it recommend it you anyone. Eventbrite is so fast & easy! This event that I’ve always kind of wanted to go to and help out. so if anybody has a new advice/suggestions or anything in general , please would it be best to bring what kind of a toy how big and etc. for these lovely volunteers kids, I will please gladly love to listen, if you take the time out. my email is Roberts mobile detail at Gmail.com or you could text me 619-561-1714 with some much-needed advise thank you. I am putting in a review because the app works with apple wallet and I love that. Not many apps work with apple wallet so thank you to the app developers. I think Eventbrite is good. I think Eventbrite is a good one on the Apple App Store. It is useful. Haha just messin’ but honestly couldn’t get in earlier cause of a server issue. Bought my tickets on FB. THEN I downloaded the app. I was still able to get mobile tix! Quick setup and easy to you. Your tickets are immediately added. Terrible. Waited in line for one hour. Only 3 out of 10 vendors had samples. Want refund. Fast purchase ticket and very convenient. I installed this app. Then I opened it. As soon as I open the app, these guys bother me to rate. So I gave 1 star. Convenient Efficient At my fingertips! This app is wonderful. Thank you for all the exciting FREE events that boosts up my SOCIAL life. Being a disabled VETERAN & suffers PTSD & MDD it made my life more fun & exciting. Eventbrite makes all of your events hassle free! If you’re looking for something to take the stress out of what should be a great time in your life, go with Eventbrite! Makes all of your events hassle free and you starting looking forward to the events coming up on your calendar! It’s always going to be a Big Thing with Eventbrite! The best and you don’t have to do anything. But the tickets!! Set up an account. Too confusing to move around the app now. Doesn’t tie into iOS credit card scan feature yet. Couldn’t find event via search, had to search on google, then link into the app to order. Umm... Am i missing something? I sometimes find your site/app confusing. In the past we’ve ordered tix for Longmire event, had a family emergency and tried multiple times to contact eventbrite for help in refunding tix. Wasn’t even about the refund $$, we were trying to put tix back in the pool at sold event do someone else could go. Amazingly quick to take the money but not assist with questions. Outside of providing my event ticket there is no functionality when I compare to other apps like Event Mobi. You should be able to complete a profile, add a pic, link with Linked In and view an attendee list. I find events nobody knows about yet in Eventbrite ! Love it! The site is slow, difficult to navigate, does not list events even though advertised, no search option for facility. Such as Miners Foundry or Nevada Theatre. No way of contacting. Why did Eventbrite take away the ability to use Apple Wallet? It might list something happening in two weeks then today then next month then two days out. Fast. Easy to use. Easy search options. Easy to understand verbiage used throughout the app. 5 stars! Love the convenience and easy access of great shows at your finger tips. So easy to search and purchase tickets... then no paper to top it off, fantastic. Tried to retrieve my tickets after downloading the app. App wanted a password & its my first time to open the app. Had to pay cash at the gate to get into the football game. This site was easy to maneuver. As much as I appreciate digital tickets, I found it painful to complete an address and email for each member of my family. Please consider a feature to populate the same information multiple times. Hate the update- it now takes extra steps, that are not intuitively obvious, btw, and a lot of time to download purchased tickets. This app has a good search function and is quick to get your tickets. 5 stars. Tired of having of re entering my information. Doesn’t recognize me as a past user. Very Easy to use, love this App. A great app for finding out what’s going on around you. updates the events in my chosen cities and can get Tickets without leaving the comforts of my home. Easy to use and great info for things to do! This app may be simple to use, but without the option to select your own seats, I will use the box office next time. What are horrible app. I bought tickets online at eventsbright.com and downloaded the app before going to the event. I open the app, sign in, and cannot find my tickets. The UI is very difficult to navigate. Today I try to use the app to find events near me. It defaults location to San Francisco and I don’t live in San Francisco. When I try to update my location it won’t let me enter a location. You must allow them to use location data for your phone or you can’t use the app. What kind of app is that? How do I use this app without giving at location data? Garbage. Cumbersome doesn’t even begin to describe this app. If someone can tell me how to edit number of tkts that would be amazing. Yes, I’ve done everything that the app asked me to do and, then, when I clicked on “app support” here, it sent me right back to where I’d already been on the app 4 times before. I’m not a neophyte, technologically speaking; in fact I’m pretty savvy but this UI is so badly designed that I won’t try to use this app again. This app is very frustrating. I searched for something i already registers for and nothing came up. Great for phones, not good on my iPad. When I am required to get a ticket from ANY ticket provider I just want my ticket without brain challenges, ya dig? Eventbrite tries hard to get my location and to agree to other apps. Don’t “make” us do anything except easily get a ticket. On my laptop I accessed my film fest ticket for tomorrow night on Eventbrite, but it seemed my only choice was to print it, but I live far from any printers and an trabeling to the event. Or the other choice was to call the organizer? Your HELP/FAQ was also unclear. It should say, “if you’re using a laptop and don’t want an eventbrite account and to take 15 minutes navigating and telling us about you without your knowledge, click here.” Or something shorter and friendly like this: How about, if you don’t have access to a printer you’ll need to download the eventbrite app for an e-ticket that you can present at the door. I took plenty of time looking and reading to try and solve this. (Of course there’s no one to call.) Finally, I figured out I’m required to download the Eventbrite app on my phone to get my e-ticket. And in signup you try every which way to get location and agree we agree we agree to give more info, and read and understand disclaimers, why? To enhance the ticket-getting experience? You’re simply a ticket provider in this case, and not my personal event planner or annoying friend. Please design a ticket program to first give and get MY ticket quickly and easily, then hit the user with requests that lead to more advertising offers, signups, and invasion of privacy. Just trying to see the tickets I bought. Not straightforward. Trying to find a specific thing is not easy ~ what’s the matter with the search tool! Totally useless app. ONLY allows you to look up events and NOTHING else! There’s a separate app to manage your events. But NEITHER app allows you to CREATE events. Just disorganized and useless! You always can find something to do! Eventbright is the place to go visit if you want to find something to do that fits your life! This app is convenient and easy to use as well as easy to find events going on around me. I cannot delete old tickets off the app and from Apple Wallet. It is driving me crazy. I’ve searched online how to do it but there is no “remove” option when I click on the “I” on the lower right corner. I’ve also tried to do it through the app but neither take off the tickets. I am having too much trouble finding tickets I purchased. Login process using saved passwords doesn’t function and is maddening. This app knows what I like and when to offer it to me. So frustrating trying to get these tickets for a graduation. The event doesn’t come up when I do a search, I have had to download the event rite app on my phone, when I don’t want it, and now the tickets are going to be on my phone instead of my laptop where I could have printed them off! So frustrating trying to find and use. Easy to use once the phone gets set up. Please support Applepay. I am tired of bad programming that allowed British Airways, Ticket aster, and Newegg to be hacked. Applepay protects our CC by using a token. When did they start making you put in a location?? Took me 10 minutes to figure it out - very frustrating! I like having my tickets handy in my phone. I do NOT like have to have location services on in order to access them. So I’ve never had a ticket issue with Eventbrite until now. Recently purchased some tickets to a local event and when I saved them to the Wallet app on my iPhone I couldn’t find them. After searching every single ticket I found them grouped with an unrelated even from another year. This makes no sense because now I have to either remember this or delete the tickets entirely and just print out the paper version. The point of digital tickets is that they or organized for you which I never had an problem with until now. Anyway I hope this gets fixed soon. I spent $45 on tickets to go to this Glow Fest event that didn’t exist. I was scammed out of my money! No numbers to contact anyone for info or anything. I want my money back! This is unacceptable! Bought a ticket on eventbrite and was forced to download this crap. Everything’s groovy. I couldn’t add a photo to my profile. But I think that’s because of the latest Apple update. Bought two tickets for OC auto shows 2018, the lady at the entrance couldn’t verify the tickets; I had to go to the box office to get paper tickets. Nice integrations. Useless app! I’ve liked the app so far. It is easy to use and does what I want it to do. I usually have a paper ticket as a back up just in case, but I have never needed it. I needed to create a second account because of an invite to my work email. You should allow multiple emails per account. So easy to purchase and not have a paper trail. Adding to Apple wallet is very difficult!!!! The app allows me to attend events that I am really interested in. It’s so convenient to search events in the app. Update: it’s been over a year and I still cannot remove the event tickets from my wallet. Amateur. On the other hand, I bought movie tickets the other day and put them in my wallet. Guess what...the next day, after the movie, they were gone. What a concept. I haven’t used this app since last year plans won’t ever again. Original post: Don’t add a ticket to your wallet unless you don’t mind seeing it there forever. There is no way to remove tickets from past events. Apparently, this is a “known issue” and the only response I got to my feedback. Find great local events. Great for finding things to do on a date or just making plans for the weekend. And convenient, easy to use and displays tickets right on the app so no need to print! Eventbrite makes it easy to not just store new tickets, but keep track of old ones. Useful for fact-checking prior attendance. Cool App...if it would let me sign in! New user here, bought tickets and wanted the app too see more and manage but it won’t let me sign in. I click to log in but it won’t let me put in my password, it only sends a link to reset my password. Very user unfriendly. Can’t find the ticket sale time for an event. Looks like you can only search a handful of cities. Helllllpppp! Getting to the e-tickets was difficult- not clear what is needed and ultimately which password was used. After downloading the App and trying several times - and providing much more information than needed - my city, my location, my phone number, my email, multiple passwords- all too cumbersome and questionable need - possible identity theft and marketing information- privacy beach etc. Also need a nickname to provide feedback- why not anonymous or go to your P.R. people? Great app, but why still no Apple Pay? Eventbrite is great for finding out what's going on (and for putting on events!). But it's a serious bummer that they still haven't added Apple Pay support after what, four years now? It costs Eventbrite nothing to add Apple Pay support, but it lets us pay for things with a single thumb tap. It's a no brainer. Cmon Eventbrite. This app is perfect for finding fun and entertaining events in Wichita Falls and the surrounding areas! The fact that it makes your tickets available at the touch of a screen is great!! I was told Drake was going to be at San Francisco City Hall and he showed up but didn’t perform or even said hi. Had I known I would be paying $300 for that I would never have even considered. You can find everything here so no excuses get out and do something. This makes my event planning so simple !! 1st time using, I’ll get back to you! Eventbrite is great. It’s allow to see the event and also you can find cheap price for the event. It good. I really enjoy the site. I can constantly find things to do and it’s a great way to connect with others. Love it! One of the most useless and frustrating apps ever made. Impossible to search for events that I know are happening. The app has no way to follow or get updates for organizers I'm following. I have to use my browser for all Eventbrite events and only use the app to store tickets. No complaints, this is my favorite app on my phone! I FINALLY have a “Things To Do” list! What better way to christen the holiday season than with an Eventbrite cornucopia invto which I may store a wealth of invitations? So many events? So little time. Thanks, Eventbrite! Awesome way to attend events! Absolutely enjoy using this app to attend events in most cities! This is a handy app no need to waste paper! Would like to say how much the events are appreciated...my girlfriend and I have a had a great time. Thank-you for such an amazing app!! Once in a lifetime you meet an author who seems to understand how you feel. You can listen to his writing and it’s not about the character but you become the characters. The event Brite celebrations are exceptional and there is an empty chair tonight. It is mine but I am well and writing it from my little home here in South Carolina. Not far from the guilard center where you are. I was at the cabin last week when the storm rushed through and I had said a prayer just before I heard a crash. I looked outside and a big oak just missed our historic cabin. Nicholas too and many others of us have tried to weather the storm. In the morning five deer watched us clear trees. It took probably sixty years to grow those trees. I hope someone plants more. Everyone is giving to the Red Cross and helping each other the best we can. My mother was a Red Cross volunteer and so am I. I did make it to Greenville to the event. My life was the real life Savahana married to John. That was a lifetime ago already. It’s hard to believe someone could capture our real lives and put them onto paper. Other books by Nicholas Sparks I could find myself in. Gabbys point with those puppy’s and the vow. And I have a safe haven in my life also. But Nicholas Sparks captures so many people feelings so well in words that no matter which heroine he writes about I know how she feels. An amazing author. I got his latest book and have read halfway through. I was overwhelmed. I got it for my daughter. And one for myself but I cried. Part of the story is actually magical. That’s the part I hold onto. The second copy I bought I need to pick up somehow or see that someone gets it. A book is powerful. It’s intimate. Someone ask who died in the novel. Well there were many deaths and I suppose it’s something we each must face. Were created were unique. Even the animals you’ll have twins ok some are almost a carbon copy. Like in dear John I watch the movie and see the actress and I remember there were how many soldiers going through the same thing. One thing that John had told me before he went to war that the dear John letter is a saying that goes way back in history and had happened before he told me never ever send him a dear John letter. I’m sorry we write so many letters back in forth in our lives and the ones I write to him all I could say was dear John. In that respect it was as if we had lived before. One thing also the author does so well is makes us question our choices our decisions our actions in a good way. Look at us how are we acting. What are the consequences of one tear and what causes that tear to be shed. And can they be unshed. Love means never having to say you’re sorry but sometimes it’s necessary. Stevens forgiveness star. Jan 6. He’s another author friend of mine who passed away recently. I was blessed from my childhood to be raised in an amazing library surrounded by books. My father was my first story teller. The place was divided between fiction and non fiction but my father showed me a secret. He said something that you think are fantasy are reality and visa versa. You know big foot? And I’d laugh and he said you know a space ship and I’d laugh. What if though. What if your life on earth has a greater purpose? What if someday someone is going to write a movie about how you style your hair or how you drink a cup of coffee and how you saved that kittens life. And what if they include the grief you feel when the kittens Mother’s isn’t able to be saved. And you look around yourself and say I love this little house I love my life. And it’s in a book I can read about it and it’s in a book I can imagine I was there and can almost taste that coffee. Or maybe I’d rather have a cup of milk. It seems like a simple moment but life is made of simple moments. The grief that we are experiencing in the hurricane will make some of you feel there is no god. It is a really hard thing. My father was a sailor and I’ve been through hurricanes with him before. I can not tell you what to believe and when you loose your faith I can not tell you to have faith. That is up to the individual. Earnest Hemingway was pretty depressed when he wrote the old man and the sea. But I’m glad he did. I’m glad for books. The red pony too. What makes every breath so important is that every breath is a gift from god and important. And the mailbox is magical. You can send letters through time What will you put in it something happy or something sad. Will your words change a life for the better or for the worse. And do you have to send every letter that you have? And can you create a letter that changes a life. Nicholas Sparks said he could have written a better book if I hadn’t dumped John. I don’t even want to talk about it. I just wanted to let you know why my seat is empty today. Also my guest a little furry friend is a bit tired from travel. She would have Been happy to come again. Greenville is practically on the other side of our great state. And traffic well it actually wasn’t too heavy. Oh every breath there’s one other reason why the book means so much it’s because of adoption. Adoption affects my family. There are adopted members. It is an option for someone. And it has touched my life. It touches my heart to know that Nicholas wrote about it. It also touches my heart that he is willing to talk about intimacy. So openly. Some people are like no not that part and others are like oh read it again that’s the best part and some people are like what is a book like without it. Then the hero. The unexpected stranger who calls and changes everything. One last word on Nicholas Sparks he has a million readers. He treats his readers special like he genuinely cares about each one. One lady said he sent my mother a greeting card. It was so special I came across the nation to meet him in person. That’s someone who cares. This app works well and is a great way to acquire event tickets. Yea for not having to remember papers tickets. All I want to do is be able to use the app for tickets I have purchased rather than having to print them. All the app wants to do is get my information and tell me what I can do around where I live. I already know that. I won’t use this app again. If you’re trying to find events in ur area FORGET IT ! While you can put a location in the search bar Eventbrite completely ignores this and shows you events hours away! I like in New York City, and when I put in Manhattan it kept showing me events in Philadelphia!! Please fix this , it’s super annoying ! Often has trouble getting to the internet, even when other apps are just fine. Like a couple of days ago, while I was in line and noticed that coverage wasn’t so great. So I opened the app and went to my ticket. When I got to the counter I woke up the phone, only to find that my ticket wasn’t displaying because Eventbrite had logged me out. And I couldn’t log in again because of the poor coverage. Good thing the place had paper backups for this supposedly sophisticated app. I love this app. It saved me a long drive back to work where I had left the tkts for the event. It’s a good app for keeping mobile event tickets. Recent versions insist that you select a city so they can fill the app with useless junk about every event in the area. I don’t want that but I can’t see my tickets without it. This is a terrible change to a formerly good app. Eventbrite caved to the left by banning the Proud Boys from future events. It’s time to deplatform Eventbrite. The only reason I’m using this is because Groupon directed me here upon purchase. When applying a promo code you have to literally search out the option, as to confuse the customer into purchasing more. That’s shady. Please improve the app to be better the just a web page. Stop pushing me events. But polish your app so it will be pleasure to use. This app is amazing. It gets you in free to many places here in Miami. The dates on the ticket main screen are correct but once you click more info on the tier 1 tickets it says August when it should say March. I love that I skip the long lines and my tickets are on my phone. The savings is also a plus. So easy to use and check out events around you!! Downloaded and almost immediately deletes it. The app last about one minute on my phone. I downloaded it, attempted to sync either FB or my email to it, because that’s were all my tickets are and I was told the app would keep all my tickets handy, could find no such thing. Attempted to “log in” only to not be able to. Not a great app. Not even a good app. Eventbrite makes it very easy to find events, buy tickets and have them handy when needed. So easy to use!! Love this app for saving time and organizing and sending reminders. Good improvements. Needs an iPad app. While I like the way events have been categorized, there should also be an option/search bar to make it easier to search for an event by name. Paid for a networking event. Got all my supplies and items ready. Showed up. No event. No event planner. Called and emailed such person got not response. The note that was left on window said to go to another location , drove there but no vendors, no event, no planner. Called , left messages. Called back I was sent to vm. The app is easy to use; however it does not allow me to opt-out of receiving advertisement from the vendors. This app has never let me down. Kudos to you guys! The band is FANTASTIC, weather is wonderful. Love the venue, especially VIP seating. The outside bar isn’t that great(limited selections) but the patio bar is just a few steps away. This is a must do at least one, if not every, Friday night in October. Purchased a ticket online wanted to access from app. Longest process to get logged in and access this ticket. Felt like a really buggy app as I had to repeat steps and pop ups kept saying we’ve run into a problem. I have the latest iOS and iPhoneX so this shouldn’t be a problem. Please fix the app - if I get a link to an event in email & click on it, it refuses to take me to the app on my phone or even something resembling a link to get the app open. Really??? Am writing review for the first time.. I see issue after I update my Eventbrite app to latest version just now on my iPhone 7plus. whenever I open app, it is increasing the screen display lighting to MAX. Which is extremely annoying Need a fix for it ASAP. Thanks !! Excelente aplicación de negocio para poder compartir y relacionarse con personas de todo tipo y de todo ambiente gracias. My phone updated the Eventbrite app. 3days ago and when i open it it goes to a black screen with a white bar towards the bottom of the screen. The. Closes. Idk what is wrong. I’ve never experienced this before. My phone is up to date and there’s no storage issues. For some reason I cannot get to view a seat map before I purchase ticket when I use the system and purchase with an iPhone. Very frustrating that this problem is not consistently available. One time it’s there and next time it isn’t. The fact that you need to manually enter your payment information on a phone is crazy in the age we live in. Please add Apple Pay support. Great tool to use whenever you want to go to a concert or different events! I downloaded the Eventbrite app in order to get specific tickets I had just bought into my wallet on my iPhone. But when I logged in all I got was general information about events in my area. It took a while to find the unlabeled small icon in the lower right of one screen it took me to a place I could download my tickets. Thanks for wasting my time. You guys should learn to serve your customers and not just pitch things at them.Not sure I will use this app again. You certainly left a bad taste in my mouth. Design is awesome and it helps me find events to attend in my city. A very useful app to connect events with event goers. Automates everything from marketing through payment to fulfillment. Use it all the time - great app! Useful for connecting and growing your network and professional scope. Thumbs up. This is a great app to look-up events in your area and keep tickets once you purchase them through the app. Highly recommend it. I love how easy it is to use ! What’s the point in being able to follow promoters if you don’t see their content on the feed or home page? Why do I have to go to my profile, go to my followings, and individually see if the promoters I’m following have any new upcoming events? I like the app design. It’s simple and easy to use. The problem is the Discover feature. First of all, I can’t reach for a date range anymore. It’s either anytime, this week, today, tomorrow, this weekend. Not helpful at all. Second, there are so many “free” parties that really drown out the other events. It’s a real turn off. *Suggestion* add a flag feature for spam or allow users to hide events from my view. Sort of like an unheart feature. Lastly, the “sort by date” algorithm could use some updating. When I select “This Weekend” and then sort by date, it sorts all the events by the start date. This means that an event that started a month ago but is still ongoing will appear at the top. Many however are not current and simply make the search results too complicated. Buying tickets here is quick and easy! Ever heard of it? Its awesome!! How is the average app rating 4.9? I just scrolled through the reviews and it is riddled with 1 and 2 star reviews?? You guys pulling something sneaky? I’ve only used the app from the guest side and it works well. Purchase is very easy and admission using the app or apple wallet is a breeze. I wish the search functionality was better - should be able to search by a specific date. It would be better if it showed seating charts and allowed you the option to choose from available seats! There should be an option to export a spreadsheet of check in and check out times! My events are for a specific group and for safety and liability purposes I need to know exactly when each person checked in and out of the event. It would’ve been perfect for my group, but since it does not have that feature I’m unable to use it. I hope this comes up in a later update. Only rcvd one ticket not two. I just tried logging in to my already made account. I entered my email and pressed log in. It then said we sent you an email to reset your password, which I didn’t ask for. I went to the email and tried resetting, and then it didn’t work, again. Fix this please. Love this app! It’s quick and easy to get tickets for local events. Love that I can save them to my wallet seamlessly and not have to sift through all my emails to find my receipt/ticket. We have an event coming up in March, and I am so impressed with this, I’ve decided to download the app that allows me to post our events. This will be beneficial for getting the word out there. Great app! Can’t wait to use it for events/services at Released Free Church, Athens, Tx! ... on the app, had to go to the web page to bring it up. The search format is cumbersome and ineffective. If the event didn’t exclusively use Eventbrite I would have nothing to do with it. I live in one area of a large metro and am not getting job info on the major metro because my info picks up for my zip and a few miles out. No way to change this in the app? Where the help? Opening the app I already have purchased tickets on a laptop as instructed. I now wanted to get electronic access to them. The app first wants to know my location. I don’t want my location known. Finally got through the system to find my tickets. Lot harder than it should be. Easy to set up and manage your event tickets. I’ve been pleased with EventBrite...till I down loaded the helpful app. Thanks for wasting my life!!! I’ve been to a few free events because of this app and it’s amazing!!! Could not change email on iPhone. Wasn’t an option to go to account settings. Had to change on desktop computer. Then wouldn’t allow linking accounts, so I basically made a new one. Horrible and totally unfriendly navigation in the app! It’s supposed to make your life easier!!!! Love Eventbrite because it is so easy to use and I can actually find my tickets no matter how far in advance I got them. Tap on a link that opens the app, then it makes me wait through two launch screens, briefly flashes the actual page I was trying to go to, then throws it away and puts me in some “lets gather some information about you type of screen”. You did everything but accomplish the one task I was trying to complete. Love this site! So easy to maneuver and get tickets! Basically functions as one long commercial. Text is so tiny you need a magnifying glass to see it. I am a big fan of EventBrite. Congrats on your ipo too. My issue: when I log in from my mobile device on the website with my email address and the website verifies my credentials, I would have thought that the mobile device or the site would give me the option to open directly via the App, but unfortunately it does not. Please fix this. Many lost sales! Many times I decide not to buy a ticket or follow an event organizer because I am stuck using the website rather than the app I have installed on my mobile device. Their app charged me for 7 tickets whenI only wanted one. I contacted support and they were always extremely slow to answer and refused to help me get my money back. This shouldn’t be allowed that they can just take hundreds of dollars because of some bug and refuse to give it back to me. Gets worse navigating this site every time. I like this product very much. It is easy to use. It took me over 20 mins to purchase the tickets, which is not good when there’s only a couple tickets left. Not happy! It is impossible to get a hold of anyone for assistance. Very poor customer service. I just signed up, and NOWHERE can I find how much it costs! Unless it’s FREE, I don’t want it! Why isn’t the price disclosed openly instead of requiring a prospective used to jump through hoops to find out if it must be paid for? I downloaded the app for events. Why is it trying to locate parking??? I’m an old geezer and this site takes some work to maneuver through.....needs some fine tuning! This is one of the best apps. I can search exactly what I’m looking for to do in Chicago. And it keeps me up to date on events as well. 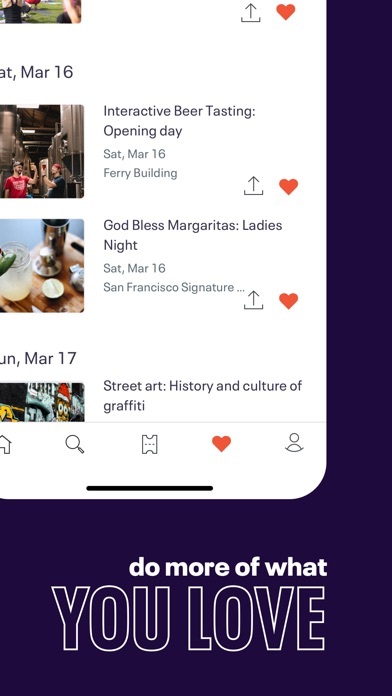 Found great events using this app and is my go to for basically everything to parties, festivals and pop-ups in my city. Love this app and I will continue to use Eventbrite. 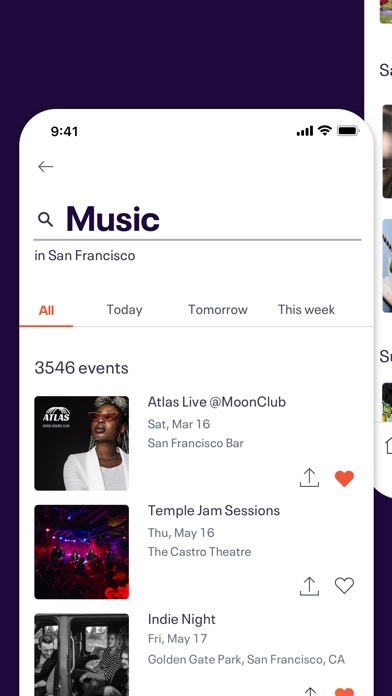 The app is good, and definitely provides value but sometimes links open up in the browser app instead of the Eventbrite app. Then I need to input all of my info and login to the browser (especially with private events). It would be nice if the the app had a way to take in a url and go to the event. Otherwise it’s great and valuable. Searching for something is useless! Ever heard of it? Its awesome!! Easy to use once you login 3 or 4 times. Great way to book tickets and facilitate!